In today’s post, I thought I’d share some details about this product, as well as a few words on why my family chooses to take an EPA/DHA supplement. I’m also launching a fantastic giveaway open to UK readers, so be sure to read on. Useful Supplements for Vegans… and Everyone Else! 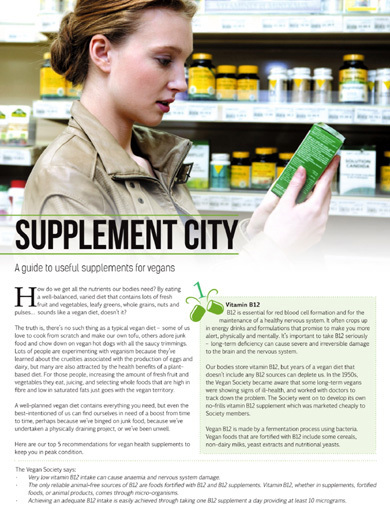 In this month’s issue of Vegan Life magazine, there was a useful guide to supplements for vegans. This is something that I looked into myself last year as I wanted to make sure the family was getting all the nutrients needed for tip-top health and not lacking anything vital. While a varied, balanced vegan diet can meet all nutrients needs (with the exception of vitamin B12), as mentioned in The Vegan Life article, there are four key nutrients to consider supplementing, and these are vitamins B12 and D, iodine and omega 3 essential fatty acids. However, it’s worth noting that it’s not vegans exclusively that would benefit from taking these supplements. As we get older, our ability to absorb B12 from foods diminishes, so anyone over 50 years old is advised to consume fortified foods and/or take a B12 supplement. The UK government’s health advisers are also proposing that millions of people should be offered free vitamin D supplements as it’s estimated that one in five adults in the UK is at risk of vitamin D deficiency. Worldwide, iodine deficiency has become a major health problem too. To reduce the risk amongst their own populations, countries such as the USA, India, Denmark and Switzerland fortify table salt with iodine (‘iodized salt’). 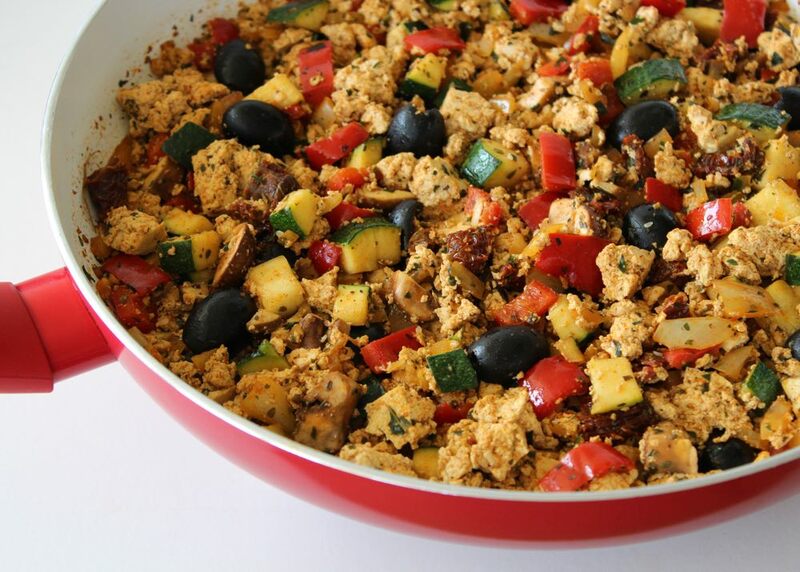 And when it comes to essential fatty acids, people are generally getting too much omega 6 and not enough omega 3. My number one choice for nutrient intake will always be food. However, for these key nutrients – vitamins B12 and D, iodine, omega 3 (especially EPA & DHA) – I’ve decided to take a ‘belt and braces’ approach for now and use supplements to top up our levels, as and when needed. Supplement – Viridian Liquid Vitamin D drops which have a nice, fruity flavour (we squirt it straight into our mouths or into smoothies/yogurt). Food – iodised salt (from Sainsburys); seaweed (Clearspring Nori Sprinkle is a favourite) UPDATE 2017 – we also love making vegan sushi rolls with nori sheets – another great source of iodine! Supplements – Since it’s not known how well the body converts the omega 3 in walnuts and seeds from ALA into DHA, I also like to give the family a supplement which includes DHA (derived from marine algae). 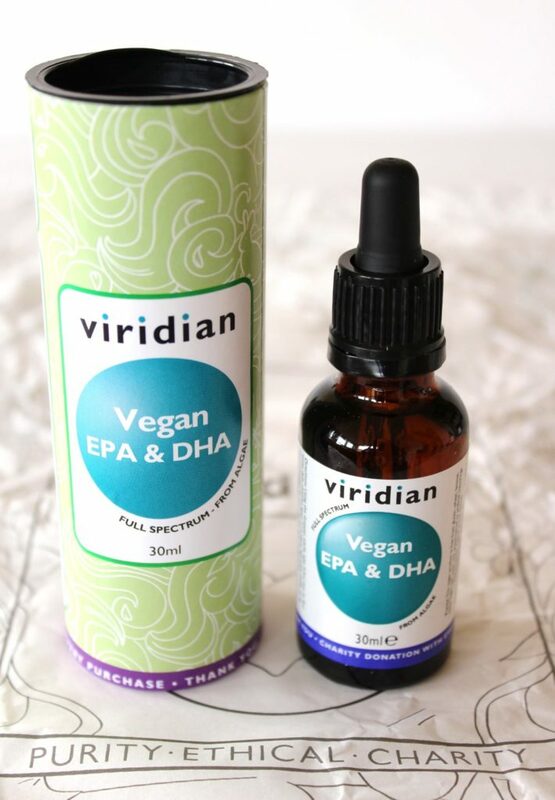 Our current favourite is Viridian Vegan EPA & DHA – a lovely orange-tasting liquid that we squirt on smoothies, yogurts or straight into our mouths! In addition to these four, I also think it’s important to pay attention to Iron and ensure that we eat lots of iron-rich meals. Worldwide, iron deficiency is the most common nutritional disorder and affects a staggering 2 billion people. While the recommended intake for men and post menopausal women is 8mg (which is pretty easy to achieve on a well-balanced varied diet), for menstruating women it’s 18mg – more than double! Considering ½ cup beans and ½ cup cooked greens each contain around 2mg, it can be quite a challenge to reach the 18 mg RDA. And that’s before we even take account of the fact that certain minerals (especially calcium), and beverages such as coffee and tea inhibit the absorption of iron. I’ve had my iron levels checked twice in the past couple of years and both times they’ve been low. Not anaemic low, but lower than optimal. 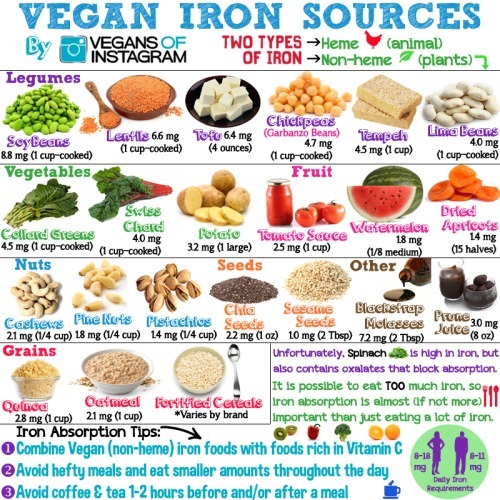 A few months ago I decided to top up my iron intake during the ‘time of the month’ with an iron supplement. I’ve been taking Viridian Balanced Iron Complex, which contains iron bisglycinate, a form of iron that is gentler on the digestive system than ferrous sulphate. I’ve had no stomach issues at all taking this supplement. As an added bonus, the supplement contains B12, magnesium, folic acid and vitamin C.
What’s your stance on supplements? Do you take any yourself? 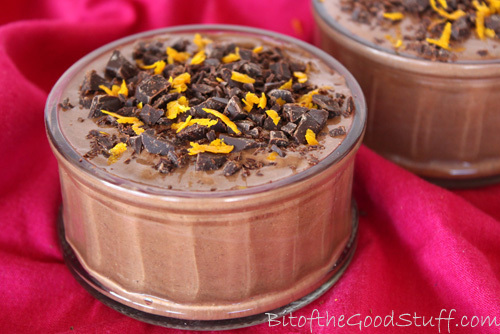 I first shared a recipe for chocolate orange chia pudding back in February 2012 and, to this day, it remains one of my family’s favourite desserts ♥ It’s such a simple pudding to make and, since I originally posted the recipe, I’ve refined the method so that it’s even quicker. Honestly, this recipe could not be more easy! The original photo I took doesn’t do this pudding justice, so I thought it was time for a re-post with the updated recipe and some shiny new photos. Since that original post, chia seeds have become much more popular here in the UK. You can buy them in most health food shops, and even supermarkets have started stocking them. They’re also widely available (and often much cheaper) from online stores. I find they can vary a lot in price, so I always shop around for the best deal. Since I use them daily in smoothies and puddings, lately I’ve been buying the Sevenhills 1kg bags as they work out much better value. You can buy them in a range of quantities though, so it’s probably a good idea to start with a smaller bag if you’re trying them for the first time (Holland & Barrett are currently selling a 100g bag for £2.49). 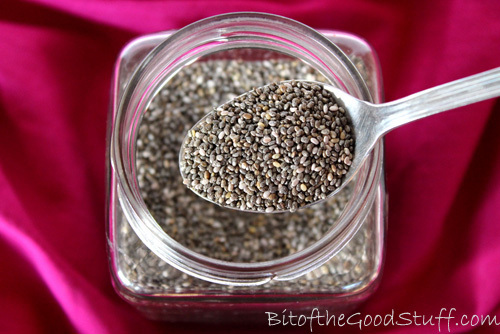 So why do I love chia seeds so much? Well, there are two main reasons. The first is their amazing nutritional profile. 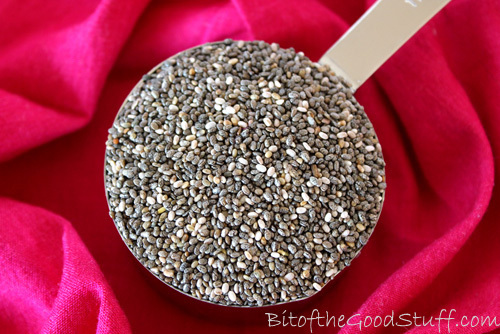 Chia seeds are very high in dietary fibre, a good source of ‘complete’ protein, and rich in omega 3 essential fatty acids. They’re also hydrophilic and can absorb around 10 times their weight in water, thus helping to keep us nicely hydrated. Their fibre, fat and protein content, along with these hydrophilic abilities, means that the seeds are a great source of slow release energy, they help to balance blood sugar levels, and they keep us feeling full up for hours. Adding a spoonful to smoothies is a great way to keep hunger pangs at bay. 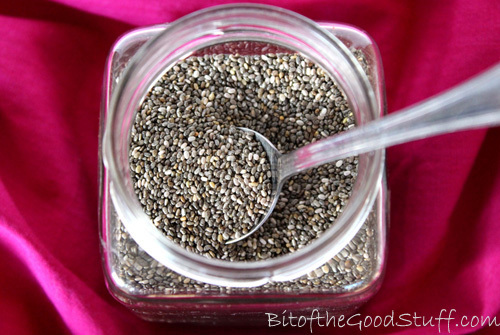 Chia seeds contain a range of trace minerals, and are especially rich in manganese, phosphorus and calcium, which are all important for good bone health. A 28g / 1 oz serving provides 30% of the manganese RDA, 27% of phosphorus, and 18% of the calcium RDA. The seeds also contain a multitude of antioxidants, including the flavonoid quercetin, which has anti-inflammatory and antihistamine properties. 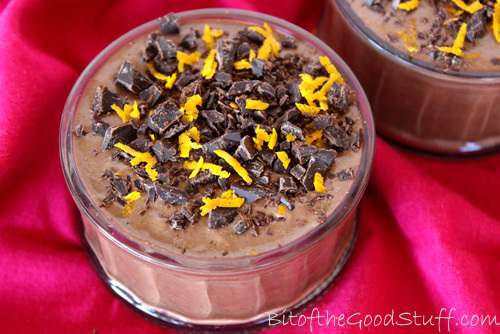 The second reason I love chia so much is that they make the most incredible chocolate puddings! Once blended with some cacao or cocoa powder and a little liquid, they transform into a delicious, silky smooth pudding that will easily rival any shop-bought chocolate dessert. And unlike the shop-bought varieties that tend to be laden with sugar and little nutritional value, these chia puddings are refined sugar free and packed with nutrition. I used to soak the chia seeds in liquid for an hour or so until they’d transformed into a gel-like substance before blending them up, but these days I literally throw all the ingredients straight in the blender. High speed blenders are best for this job as they’ll blend the seeds smooth in a matter of seconds. Since I’ve had the Froothie, making chia puddings has been a breeze. Lil’ L absolutely loves these puddings and sees them as a real treat. It’s great to be able to treat him to something that’s so nutritionally packed and full of healthy goodness. Place the orange juice and milk in a powerful high speed blender, followed by the remaining ingredients (I use my Froothie 9400). Give them a stir until they are coated in liquid, then blend until silky smooth. Stop now and then to scrape down the sides. Taste test and add a touch more orange extract or sweetener, if desired. Pour into small ramekins or cups, sprinkle on the garnish and chill until ready to serve. It will keep for up to five days in the refrigerator. 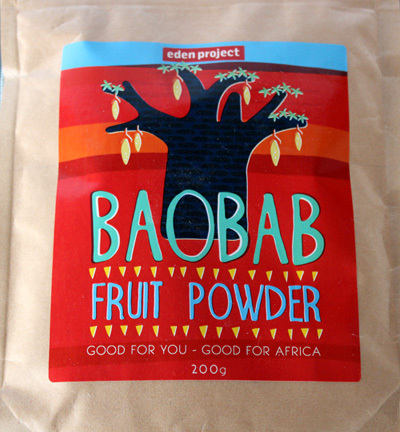 Baobab Fruit Powder & Eden Project Family Ticket Giveaway! 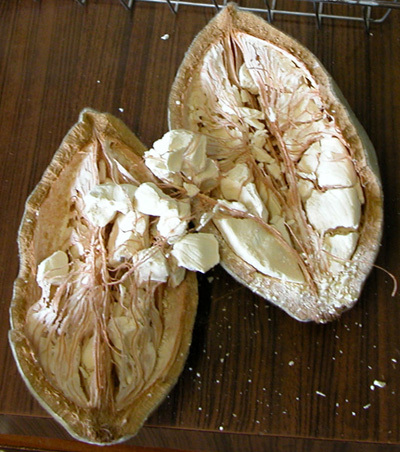 To this day, I still love seeking out new exotic fruits to try, so when I was invited to sample baobab fruit powder, I was more than delighted to accept. 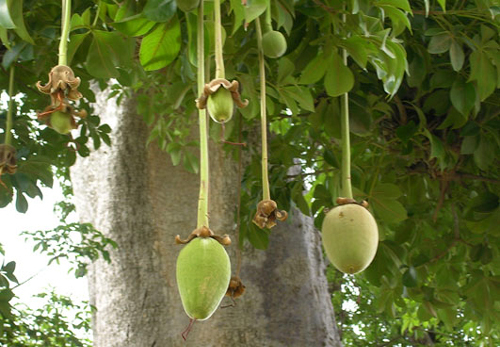 Originating in sub-Saharan Africa, the melon-like fruits grow on the legendary ‘upside down tree’, which is pollinated by bats! It’s widely consumed all over southern Africa as a refreshing juice or health snack. The Kung San bushman of the Kalahari eat it for medicinal purposes, to ward off winter colds, combat fevers, stomach upsets and as a general pick-me-up. Baobab fruit powder is a 100% natural whole food often referred to as ‘Nature’s Multivitamin’ due to its high levels of vitamins, minerals and antioxidants. It contains more than 12 minerals and vitamins, but is particularly rich in vitamin C, calcium, iron, magnesium and potassium. It is reported to contain more calcium than milk, more iron than steak, six times more potassium than a banana and to have more than 100 times the antioxidant activity of oranges! The powdery fruit pulp is obtained through a simple process that involves collecting the fruit by hand, cracking open the hard shells, then milling. Flavourwise, it has hints of pineapple and melon. I love adding it to smoothies (especially our Oaty Pineapple Breakfast Smoothie) for an extra boost of nutritional power. It can also be sprinkled into breakfast cereals, added to yoghurt, used to make jams, sauces and ice creams, and even used in baking. 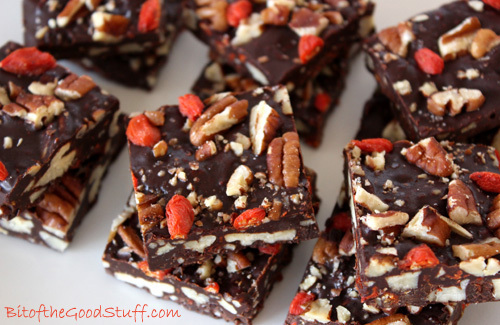 I often add it to my home-made energy bars to give them an extra nutritional boost. 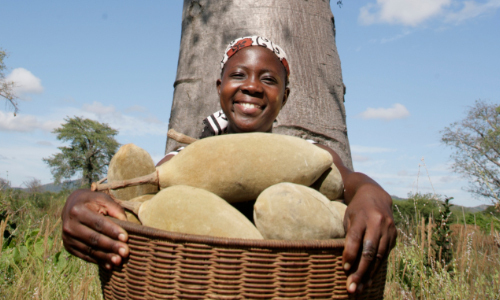 The Eden Project in Cornwall recently launched their own range of baobab fruit powder, which is sustainably harvested and bought from rural harvester groups in Malawi. 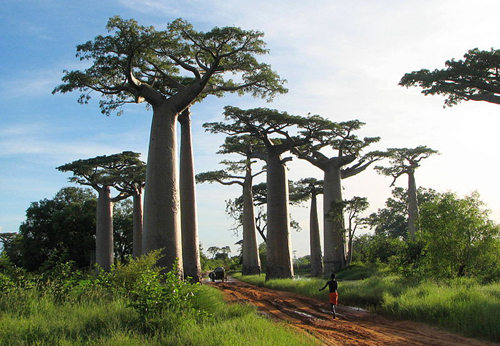 Money from every sale of baobab goes to PhytoTrade Africa, who help support rural harvesters and producers across southern Africa. The Eden Project sells a variety of baobab fruit products, including fruit powder sachets, pouches and jars, as well as gift bags, chocolate and even hand cream! They are available to purchase online however, if you fancy buying them in person, I have one AMAZING giveaway lined up for you! Described as the “eighth wonder of the world”, the Eden Project is a global garden which lets people discover plants that have changed the world and plants that could change the future. People can explore the sights, smells and sheer scale of the Rainforest Biome, take a journey through the fragrant Mediterranean Biome and zig-zag their way through the 30 acres of outdoor gardens. There are also world-class art installations, unique sculptures and exciting events to be found across the site. To be in with a chance of winning, simply leave me a comment answering the question featured in the Rafflecopter below. Do make sure you tick the box in the Rafflecopter to register that you have done so! If you’re new to Rafflecopter, it’s pretty easy! Simply click on ‘Use Your Email’ and enter a name and your email address (rest assured it won’t be published anywhere). You can also log in using your Facebook account, if you wish. A quick demo of how to use Rafflecopter can be accessed here. There are a number of additional ways you can enter in order to increase your chances of winning. You will find these listed in the Rafflecopter. All entries will be verified prior to the winner being selected. NB. If you experience any technical problems when trying to enter the Rafflecopter, leave me a comment below and I’ll submit your entry for you. My love affair with the little goji berry is still going strong ♥ I adore their sweet/salty flavour and vibrant colour. I eat gojis every day, sprinkled on my porridge, muesli, yoghurts and chocolate chia puddings. And, as you may have seen already, they’re my favourite ingredient to add to home-made chocolates. 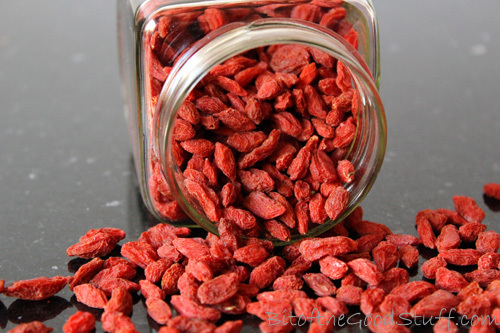 And did you know, goji berries are one of the most nutrient-dense foods on the planet? They are a complete protein, contain 11 essential vitamins, 22 trace minerals, and are packed with antioxidants, including flavonoids, polyphenols, carotenoids and vitamins C, E and A. They contain more vitamin C than oranges, more betacarotene than carrots and more iron than spinach. No wonder the goji berry is referred to as the ‘fruit of longevity and well-being‘! Recently, nu3 invited me to take part in blogger challenge to create a recipe using their goji berries. Of course, I was more than happy to accept! I started to think of all kinds of weird and wonderful creations, but M suggested that I should keep it simple and rather than creating something new, I should share one of our family favourites. And heeding his advice, this is what I’ve chosen to do. 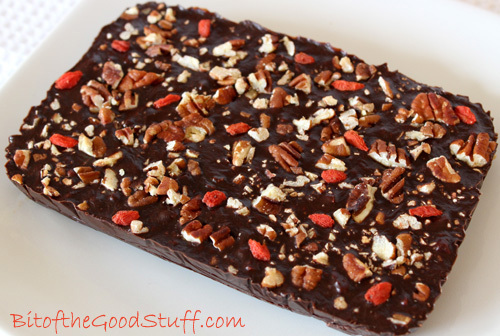 My entry for the Nu3 challenge is a simple home-made chocolate bark. M and Lil’ L mentioned to me the other day that this could actually be their favourite chocolate ever! Now that is a statement! I make this chocolate using virgin coconut oil (instead of cocoa butter), which gives it a gentle hint of coconut flavour and a glorious ‘melt-in-your-mouth’ sensation. It also features two of my favourite ingredients – goji berries and pecans – which add extra dimensions of flavour, texture and nutrients. 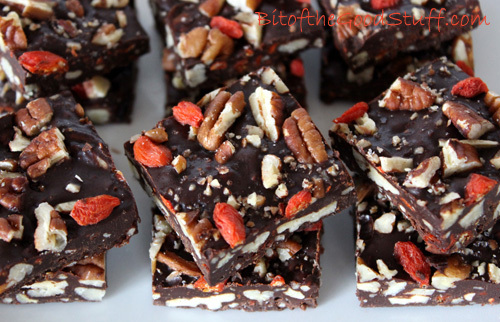 This chocolate is incredibly easy to make. No expertise required! You simply melt the coconut oil, stir in the remaining ingredients, and pour them into a container. I line the container with cling film, which makes it really easy to lift out. Sometimes I toast the pecans prior to chopping them but this isn’t an essential step. It is up to you how you choose to break up the chocolate. You can either go for the rustic look and chop it into shards, or go for more uniform squares. Line a container with cling film, leaving sufficient hanging over the edges so you can lift out the chocolate. Roughly chop the pecans and place 2 TBSP in a mini food processor along with 2 TBSP goji berries. Pulse until finely chopped. Add a small amount of water to a saucepan and place a heat-proof bowl on top. Gently heat the water. Throughout the chocolate making process, you want to keep the water gently heated. On my electric hob, once the water has reached a simmer, I turn the heat down to 2. On a gas hob, I suggest turning the heat off once the coconut oil has melted and just give it an occasional blast of heat, if needed. Roughly chop the coconut oil and place it in the heat-proof bowl. Once melted, whisk in the cocoa powder. Next whisk in the liquid sweetener. I use about 2½ TBSP Sweet Freedom. If using agave syrup, 2 TBSP should be sufficient. Taste test, and add more sweetener, if needed. 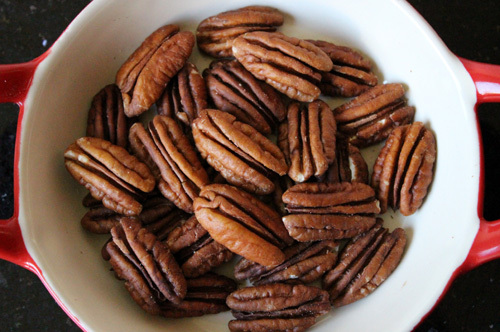 Remove from the heat and stir in the finely chopped pecans and goji berries, along with another 2-3 TBSP of the chopped pecans. Lift the bowl and dry the bottom with a tea towel, before pouring the chocolate into the prepared container. Tap the container on the worktop to remove any air bubbles. 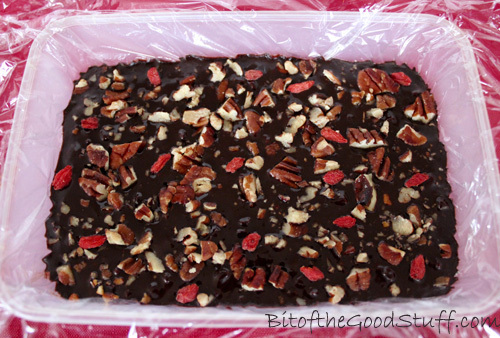 Sprinkle the top of the chocolate with the remaining chopped pecans and whole goji berries. Lightly press them into the chocolate. When completely cool, place the chocolate in the freezer until fully set (around 1 hour). Once set, lift the chocolate out the container and cut into pieces using a sharp, smooth edged knife. Coconut oil becomes soft at room temperature, so serve the chocolate straight from the fridge or freezer. In an airtight container, the chocolate will keep for weeks. I think nu3 are planning to invite the public to vote on the entries and a prize will be awarded to the entry with the most votes. As soon as I have the details, I’ll post a link.